It had been quite a few years since we last visited Urmston and as we didn’t want to go far on this Saturday afternoon we thought we should reacquaint ourselves with the place. 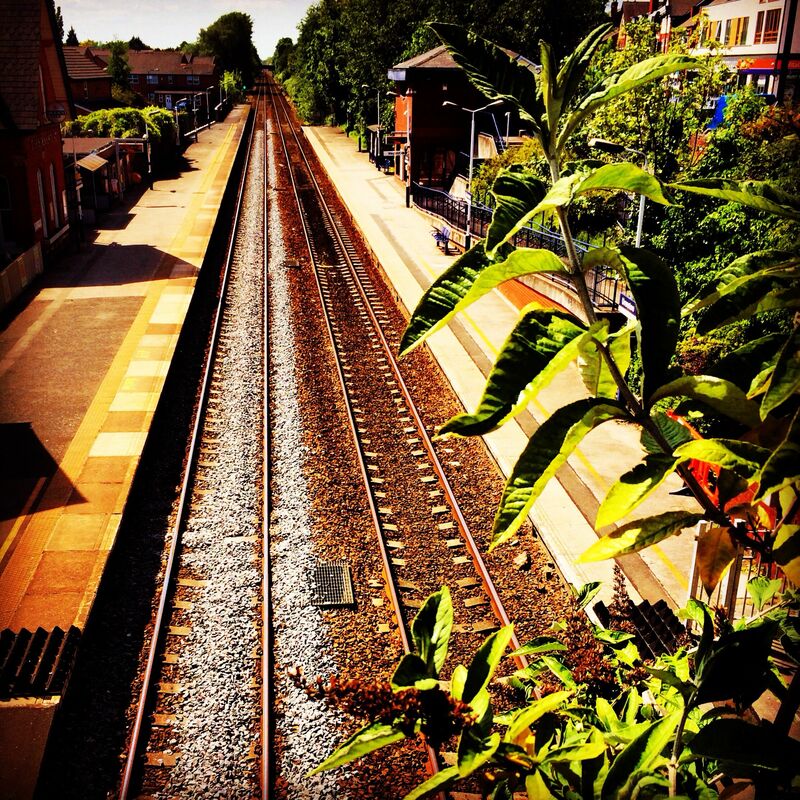 Urmston is tucked away in South Manchester near Trafford Park and Stretford. The easiest way to get to it from North Manchester is to go on the M60 and get off at Junction 10. However this can be problematic at times as it’s also the junction for the Trafford Centre and traffic can be backed up over Barton Bridge especially on a Saturday. A quick tip for day trippers to the Trafford Centre: a good time to go is on a sunny Saturday. If it’s bad weather the place will be rammed and the M60 anti-clockwise south bound will resemble a car park. Back to Urmston – as it was a sunny day it was a breeze getting off at junction 10 and we headed on the B5214 into the town centre. Parking was straightforward as we parked up in Sainsbury’s multistory where there is three hours free parking. You can even get your car cleaned and valeted there. Sainsbury’s is attached to a modern shopping centre where all the bigger stores are located. As Urmston is a suburb the main shops in this centre tend to be cheap stores like Poundland and Quality Save, which seem to be popular with the locals. Sometimes having lots of these cheap stores can be a little depressing. However as the shopping centre is modern and has a couple of nice cafes the atmosphere is positive. We walked into the town centre and the shops seemed to radiate off a junction near the train station. First of all we wandered down Flixton Road and found some interesting shops. 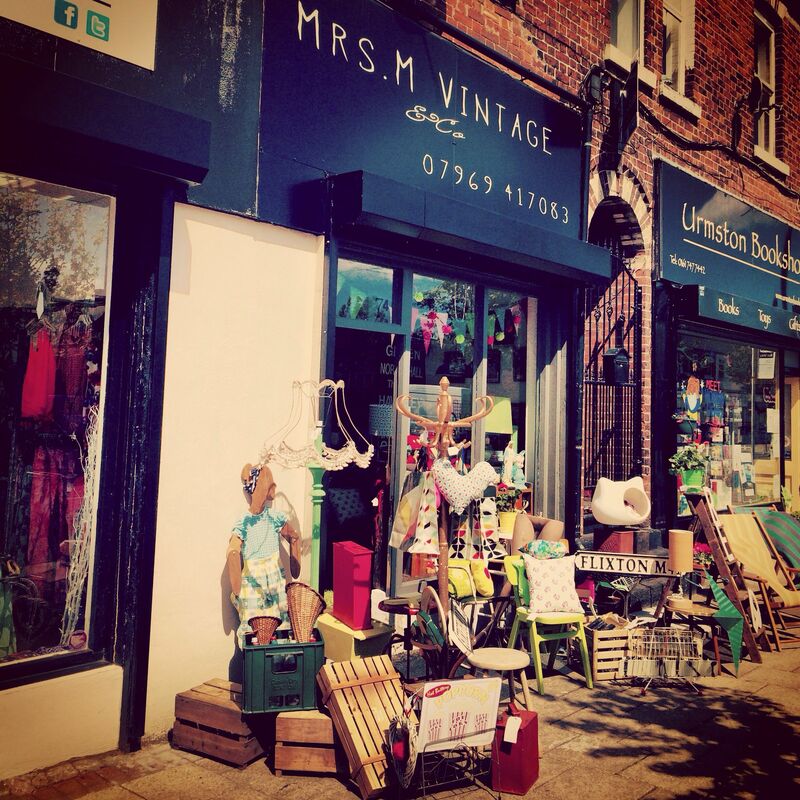 I liked Mrs M Vintage shop, which sold a mix of vintage and vintage style new stuff. The outside of the shop had a pretty and inviting pavement display, which reminded me of shops from the 1970s. I love to see an independent bookshop and Urmston does not disappoint with Urmston Bookshop right next door to Mrs M’s. It has its own café and does quite a few events. In this day and age with the behemoth of Amazon endangering local bookshops, it’s important for the independents to diversify their activities to survive. I was quite impressed that Urmston had lots of independent shops on its high streets, although for the life of us we could not find a florist. You could get flowers in Sainsbury’s or the market, but we simply could not find a florist shop. Maybe we were looking in the wrong places. Back to the shops – as a craft fan I loved the fact there was a wool shop, and further out of town on Davyhulme Circle is Bon Fabrics. Whilst it doesn’t have a huge selection of fabrics, they are great value, good colour choices and the lady who served me was lovely and very helpful. 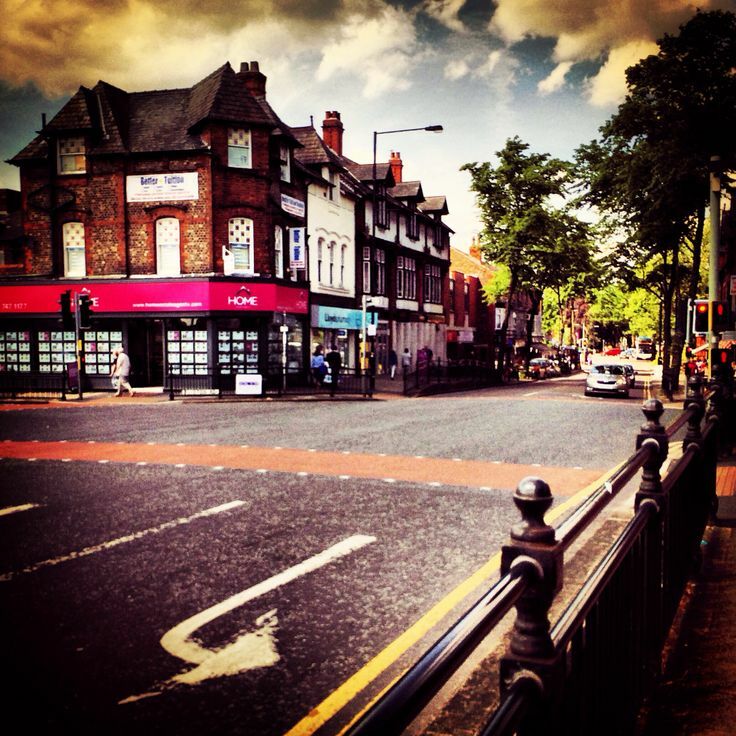 If you live in Urmston, you could easily eat out every day of the week. There are loads of cafes and restaurants to choose from. You will definitely find somewhere that suits your tastes. I noticed Darby’s seemed pretty popular with the locals. Even in the little market the café seemed popular with the older residents. It’s not often you find a market in suburbs like this, although the good weather had driven people away either to the seaside or their gardens and barbecues. The market stall holders were chatting and enjoying the rare British sunshine. It was a mix of traditional cheap clothes, food and craft stalls. According to their website, throughout the month they have different market themes including vintage & antiques, artisan, craft & homemade and family fun day. You could easily do a pub crawl around this town. 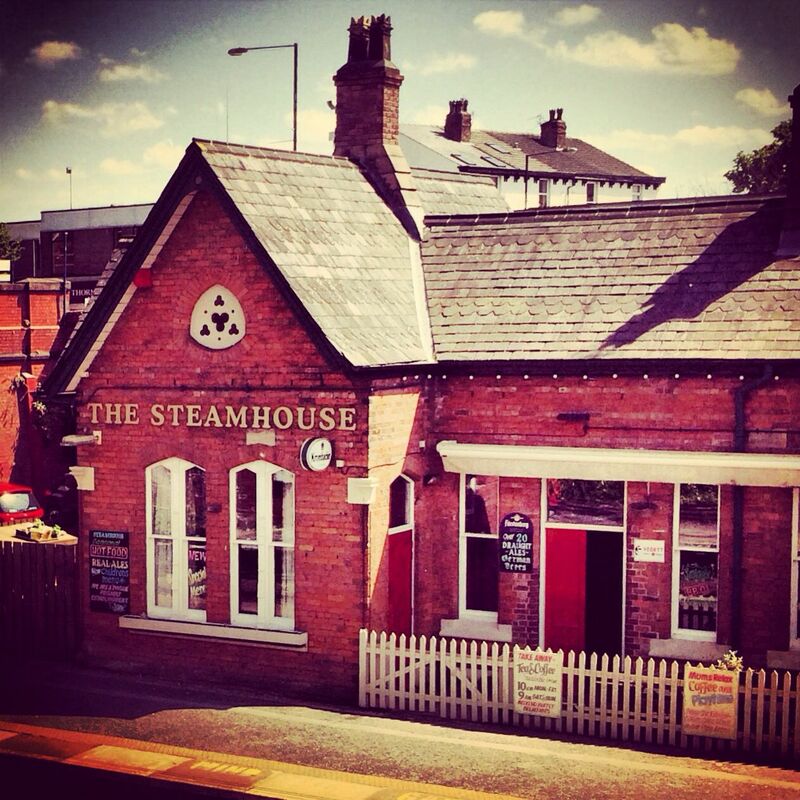 If you visited Urmston by train, you could start your pub crawl on the station platform as there is a pub called The Steamhouse. There is a Wetherspoons randomly called The Tim Bobbin. It appeared to be housed in a former cinema. Outside one of the pubs I noticed a weather beaten old bloke sat having a pint and a cigarette. He was randomly chatting to himself. I had to double take and check if he was using a phone – he wasn’t. In a weird way it’s nice to see as he added character to the place. Obviously we did visit all the charity shops. Whilst Neil didn’t find much in the way of vinyl records, I did pick up a cheap mirror for our bedroom. The trouble with suburban charity shops is that the good stuff is picked up very quickly by people who sell vintage goods. Still I did see some good quality clothes on the racks. Although I do think there would be a market for a good charity secondhand book shop like Oxfam books in Chorlton. Whilst most of the charity shops are on the main roads, blink and you will miss two charity shops on Gloucester Road, just behind the Italian Job restaurant. Urmston has managed to retain much of its Victorian character. Just look up and you will see lots of the original features. Around the town centre the residential streets are Victorian terraces and I expect parking can be an issue from time to time for residents. Having seen many Manchester suburbs become overrun with developments for new flats, I sincerely hope this doesn’t happen to Urmston in the next few years. There are some, but at the moment the balance is okay. Looking back on our visit I can’t recall seeing that many empty shops, which is a good thing. There were lots of families out and about doing their weekly shop. Maybe it was the weather, but Urmston had a nice relaxed vibe going on. It reminded me of how Chorlton was before it was overrun by trendy bars and tossers. There is a bit of gentrification going on in Urmston, but that’s not necessarily a bad thing as long as it goes overboard. All in all, Urmston is a nice suburban town and on the upper working class / lower middle class socio-economic scheme of things. I’m certain the good weather helped, but this is a nice hidden gem of a place and worth a visit.